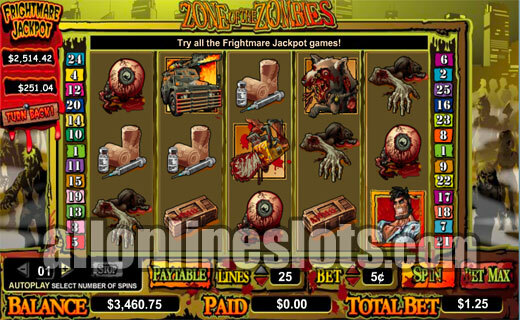 Zone of the Zombies is part of the Frightmare Jackpots series by Crytologic. It has a spooky zombie theme with an animated bonus stage where you have to shoot zombies to win prizes. Any spin can also win either or the two Frightmare jackpots. If you are a fan of great zombie movies such as Dawn of the Dead or 28 Days Later then Zone of the Zombies is the game for you. 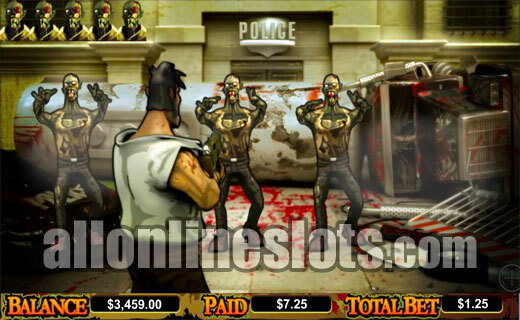 It has a great zombie theme, big jackpots and a pick a box style bonus where you get to shoot animated zombies in an effort to escape their clutches. The game is available at all Cryptologic casinos. It is a five reel, twenty five line slot with a max bet of 25 coins. You have a wide range of betting limits as coin sizes range from 1c to $20. This means you can be betting max for anywhere from 25c to a big wallet chopping $500 per spin. On the reels you have a range of gruesome symbols. This includes severed arms, chainsaws, eyeballs, weapons and of course a zombie. You also have a hero symbol which any zombie film always needs. The zombie symbol is wild and substitutes for everything but the scattered hero symbols. 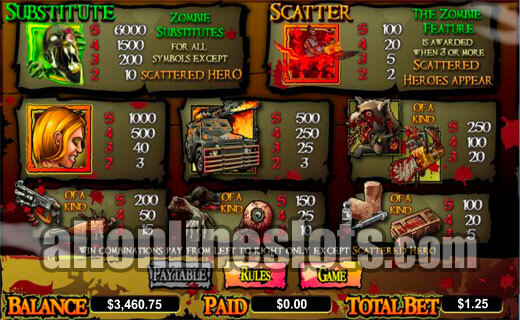 Five zombies on a pay line awards the top pay of 6000 times your line bet. Depending on the coin size you choose pays between $60 and $120,000. The next highest pays are 2500 coins for five scattered hero symbols followed by 1500 coins for four of the wild zombies. The scattered here symbols also activate the bonus game. Get three, four or five anywhere on the reels and you win a shot at the escape bonus. Here you move on to an animated second screen stage where zombies attack you and you have to shoot them to survive (View Screenshot). Each zombie you shoot awards a random payout which is a multiple of your triggering bet. If you manage to shoot five zombies without being killed you escape and receive an additional bonus win. The bonus stage has impressive graphics which really add to the whole theme. On the left of the reels you will see two jackpot tickers. These are the Frightmare Jackpot link totals. At any moment you can win one of the two jackpots. No combination on the reels is needed as the jackpots trigger at random. This add to the excitement as you never know when they will hit.